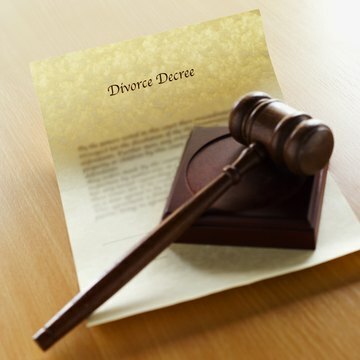 Contact your divorce attorney to see if he has a copy of your divorce decree on file. Contact the Office of the County Clerk in the county where the divorce proceedings occurred regarding its procedures for obtaining a copy of a divorce decree. Some counties will allow you to go the Office of the County Clerk and apply in person for a divorce decree. Some counties require that you provide proper identification, such as a valid driver’s license or passport. Typically, there will be a fee to obtain a copy of your divorce decree from the Office of the County Clerk. In some counties, you can mail a written request for a copy of your divorce decree to the Office of Vital Records in the county or state where the divorce proceedings occurred. Write a letter to the Office of Vital Records in the county or state where the divorce proceedings occurred. Your letter must contain the following pertinent information: date of request, both spouse’s full names, date of divorce, place of divorce, your relationship to the parties to the divorce, the reason you need the divorce decree, your name and address, and your signature. In some counties, you will need to provide a photocopy of a valid photo identification, such as a driver’s license or passport. You will also need to include a self addressed stamped envelope with your letter. Most counties charge a fee for this service.